Featuring subject matter that is as relevant now as it was when the incidents first occurred, The Post unfortunately offers lightweight treatment of an extraordinary true story, continuing to show a once-great film-maker favouring mere pace and movement over depth and grit. The film opens in Vietnam during 1966, where we are introduced to Daniel Ellsberg (Matthew Rhys), a military analyst sent by the government-financed RAND Corporation, to collect information about the progress U.S. forces are making in the country. The ensuing document, organised by Defence Secretary Robert McNamara (Bruce Greenwood), offers up explosive details about covert American action that happened in Vietnam between 1945 and 1966. This document would be known as the Pentagon Papers. In 1969, Ellsberg and fellow colleague Anthony Russo, both disillusioned by what their government has been doing behind closed doors, and the numerous young lives that have been lost because of it, painstakingly photocopy the 7,000 page document, and after many setbacks, manage to get it to the desk of Neil Sheehan at the New York Times in 1971. With the approval of managing editor Abe Rosenthal (Michael Stuhlbarg) and the publisher, the Times print the controversial story. A few days later, President Nixon takes the paper to Federal Court, wanting an injunction put in place to prevent any newspaper from publishing such revealing files, for reasons of national security. The Washington Post, among many papers that have been completely side-swiped by the scoop, want to make a similar splash with this incredible expose. 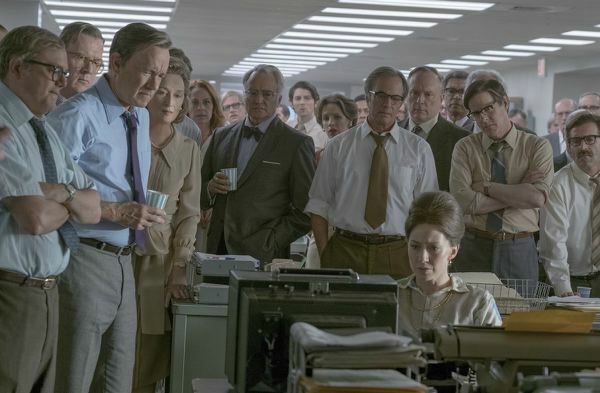 Editor Ben Bradlee (Tom Hanks) isn’t happy about being on the back foot in regards to such a huge story, and pushes his recently anointed publisher Katherine Graham (Meryl Streep) to get to the source, no matter what the cost. Graham, who due to her husband’s death, is the first woman to ever take charge of a national newspaper, is somewhat reluctant at first, for two reasons. The first is that The Washington Post is in the process of being placed on the stock market, as the business is suffering monetary difficulties, and if the court case goes the way of the Nixon administration, then the whole deal may collapse. The second reason is that McNamara is a personal friend of Graham’s, and to publish such negative details may ruin the relationship between the two. Graham has to contend with all these while also being pressured by board members Fritz Beebe (Tracy Letts) and Arthur Parsons (Bradley Whitford), the latter particularly pressing for financial stability over journalistic integrity. Bradlee is unable to see the predicament Graham is in, and what she stands to lose, and with a number of his reporters, including assistant managing editor Ben Bagdikian (Bob Odenkirk), manage to obtain a copy of the sought after document. It is now up to Graham to make the most important decision of her life, one that may see her and many of her colleagues put behind bars. The Post could not have come at a better time. The way in which the current U.S. administration has strangled, suffocated, and undermined the press in an attempt to keep its brittle house of cards upright is unsettling, especially when one sees how other prejudiced, unfavourable groups are surfacing at a greater rate, feeling more confident in expressing dated and racist dogma that would have been otherwise crushed by the trusted, hardworking press. With media suppression prevalent throughout too much of the world, this film should be a timely and loving ode to what the press truly stands for, allowing it to uncover corruption, misinformation, and incompetence of any kind, for the benefit of the nation and its people. Which is what makes The Post all the more disappointing. With such substantial material at their fingertips, screenwriters Liz Hannah (making her big screen debut) and Josh Singer (who co-wrote the Oscar winning Spotlight) certainly lay out the nuts and bolts of what transpired, but don’t layer the mechanics with a genuine human touch. It has the professionalism of a newspaper article, rather than a real flesh-and-blood script that develops into an emotionally involving drama. Exacerbating the problem is Steven Spielberg, who by directing proceedings at a breakneck pace, never truly sinks his teeth into these historic events in the way we know he is capable of, keeping such weighty subject matter breezy and featherweight. It has been so frustrating seeing this supremely talented, influential film-maker slowly lose his passionate, vice-like grip in recent years, preferring pace over potency. The acting is generally fine (Greenwood has become a staple in these true life, political dramas), but there is a serious case of miscasting which hampers the whole project. As good as Hanks can be, he never once convinces as the gruff, prickly Bradlee, and his ever-likeable mannerisms undermine his character’s pushy, stubborn persona. The person who should have played the famous editor is right there in the cast, namely Letts (Indignation/The Lovers), who would have offered a more forceful performance, as anyone who has seen the unfairly neglected Christine will attest. Hanks also indulges in what must be some of the most awkward on-screen smoking ever seen, accompanied by some all-too-noticeable CGI assist. Streep effectively captures how Graham needed to embrace the overwhelming opportunity that has come her way, while rewiring the kind of archaic, male-dominated mindset which has hindered intelligent women for many, many decades. It is a well-measured performance, undercut by unsubtle, speechifying dialogue to make sure the audience gets the message; the scene between Graham and her daughter Lally (Alison Brie, who is under-utilised) is a glaring example. Sarah Paulson (12 Years a Slave, Carol, Mud) is handed the thankless role of Bradlee’s wife, and only seems to appear to spout obvious, self-consciously worthy statements that sound artificial in the extreme. Like all of Spielberg’s films, production values are slick, except for an intrusive score by regular collaborator John Williams, which sounds like cobbled together moments from his other, better compositions. The Post is eminently watchable, providing brisk entertainment for mainstream audiences. But when you consider how biting and incisive it could have been, particularly when you compare the film to such classics as All the President’s Men, Spotlight, Zodiac, Absence of Malice, and Deadline U.S.A., you begin to realise what a missed opportunity it is, even more so when the topic presents what the potential consequences might be if the press aren’t permitted to try and keep those in charge honest and qualified.